My grandmother, Helen Getz, turns 94 today, and she's as sturdy and charming as the springerle cookies she makes this time of year. What, you've never heard of a springerle? Now's your chance to learn all about this lovable German treat. But first, the truth: when I was young, why anyone would eat a springerle, a hard anise-and-lemon scented cookie, was incomprehensible. It was white and not at all buttery. It did not melt in your mouth, but assaulted you with an intense flavor called anise! It showed up at Christmas and could linger in the cookie jar until Easter, giving my mother an excuse not to make any other cookies until they were gone. And the adults who liked them were obviously misguided. I have grown wiser with age and have come to appreciate springerle’s defensive façade. Its anise seed is balanced by lemon. Its patterned top is a thing of beauty. It’s the under-appreciated German cousin to biscotti. Moreover, I now have an actual appreciation for method and springerles are all about method. Finally, when you bake them, you do so at a low temperature so the cookies never brown. And after all that, you’re left with a hard, fragrant chip that’s as beautiful as a majong tile and a perfect partner to eggnog and warm milky tea. View the entire recipe (and save and print it!) here. My husbands aunt made these every year. I loved them for the flavor and also used them when my daughters were teething, they loved them and we never used any thing else the whole time they were cutting their teeth. added the lemon so may try it next time. I've already made 3 batches this year. Next cookie to make is Lebkuchen - another German cookie that I didn't like as a child, but now they are delicious! My Mom made these. She wet the bottoms and set in anise seeds before baking. My husband called them the "rock hard cookies with bird seed on the bottom"! No problem, there was more for me? How nice to hear this! The great thing about an early Thanksgiving -- more time for holiday baking! All of your adjustments and tweaks sound terrific. Makes me want to bake these right now! 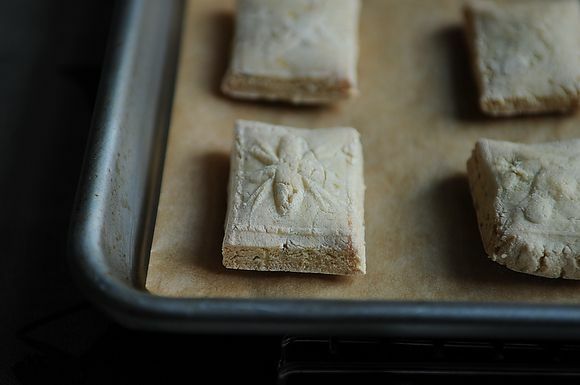 This year I used an organic unbleached cake flour for my springerles; it turned out really well! I will be gilding some for the New Year! My Great Grandmother made these every year...and I can still taste and smell them...but still haven't mastered them! Have her old molds and will try your recipe. Her recipe listed a nickles worth of and a dimes worth of ingredients....it's hard to figure that out in 2011 when she made them in the early to mid 1900's! Thank you! A dear friend of my mother made these every year for Christmas, when I was a kid. Not everyone enjoyd hem so I always had them pretty much to myself. What lovely memory and time to make them again. My mother still has a springerles rolling pin. Long survived her divorce from my father in the 70s -- he's of German/Belgian descent. Will ask her to borrow and try your recipe. For fun, check out the vintage springerle rolling pins and molds over on ebay -- magnificent! Thanks for this post. Love these! My grandmother's recipe includes hartshorn (ammonium carbonate) which you can only get from a drugstore (tho' I now use baker's ammonia!) Gives a bit of a rise to the dough -- and makes the dough itself less snackable :) My mom always made these in August for maximum crispness! I always warn recipients -- hated them as a child, love them now 50 some-odd years later. Every year at Christmas my aunt would give my dad a ziploc bag filled with Springerle because she knew they were his favorite. They were perfect little tiles, each with an imprint of a flower or a bird, just too beautiful to eat! My dad would make them last for months! Sometimes we'd find them in a drawer under a pile of papers and if we were lucky he would share. They really do last that long, a delicate crunch on the outside and slightly chewy inside and that special anise flavor; my aunt would sprinkle some of the seeds on the board before rolling them out. Thanks for your comment -- glad to find others with springerle memories. Thank you for your lovely comment. Happy holidays! Amanda - What an interesting little cookie. I happen to have all the ingredients on hand and out of sheer curiosity am going to make these. I have never heard of them, or seen the rolling pins or cookie moulds, but I am sure they will still be edible without the decorations on them! I guess I could always buy some of the scottish shortbread biscuit moulds though. No need to have the rolling pin -- that's just for show! My mother had a friend who baked these each year - and insisted that they were only hard "at first." If you left them in the cookie jar for a week or two, she said, they get easier to bite. Haven't had that experience, but certainly if your house is humid, the cookies will soften a bit. This is such a charming recipe. Thank you for sharing. I'm looking forward to making them with my own Grandma (96) this Christmas. Have fun with it -- it's a forgiving dough. How do you pronounce "springerle"? Ahh! too funny! I had a German Deli for some years and always carried these at Christmas. The German descendant patrons always snatched them up...but I was always issuing refunds to the run of the mill population. Very funny. Definitely an acquired taste/texture. It's so nice to see this post about your grandmother, Amanda. I loved the stories about her in your book. Best birthday wishes to her. If I ever get a springerle rolling pin, I'm going to make her recipe first. Great video too - and tree. Thank you -- my grandmother will be pleased to hear it! When I was little, my mother had a beautiful carved wood rolling pin for Springerles - not that I recall her ever using it. I wonder if she still has it, and if so I may have to liberate it from her. I know anise is the classic, but I have a lifelong aversion to anything in that flavor group (anisette, pernod, ouzo, even fennel unless used very sparingly - as a kid, I was black Good & Plenty-phobic.) So, is there any other flavoring you'd recommend as a substitute? Cardamom maybe? I am going to be experimenting with some lavender ones. Probably will also do some with almond oil and some with cinnamon oil. Lemon, lime and orange are other great flavorings. Cardamom works really well with orange. These will be such fun! I know these usually are left white, but one of the things that I most enjoy with springerles is painting them with natural coloring! They make gorgeous ornaments either way. Lemon and orange cardamom are great flavors, too. I wonder how lavender or rose would taste. This week while other folks are busy with dinner rolls, I may do some of these instead as gifts. I've never painted them before -- like that idea. If you make holes in each cookie, you can hang them and decorate an entire tree as decoration as some folks do with gingerbread. When they are painted, they truly are edible art! Oh my, I haven't thought of these in years. I grew up next door to a famly that made these every holiday. I became obsessed with the rolling pins and collected them at an early age. Wonderful dunked in hot tea! Would love to see your collection! I like them with Earl Grey (with milk and raw sugar).